Space exploration is pretty amazing right now. Just yesterday, we launched the ExoMars 2016 spacecraft, which will hunt for signs of life on Mars, and by now, the Voyager 1 spaccraft is likely way out in interstellar space. NASA recently announced that it plans to visit Europa, one of the most promising candidates in our Solar System to host life, and even NASA’s chief scientist thinks we’ll find alien life within 20 to 30 years, as long as we keep exploring. But how do you keep track of all these awesome space missions? 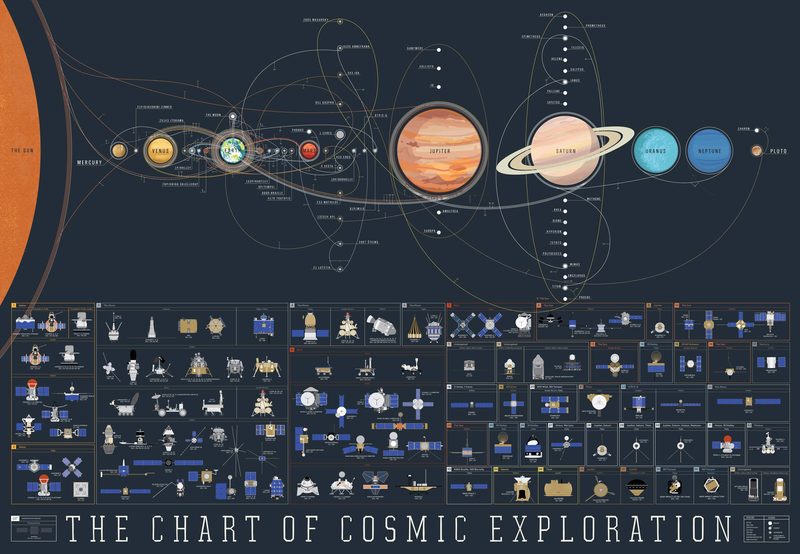 To help out, the guys at Pop Chart Lab have created this beautiful poster showing our space exploration to date. It spans all the way from 1959 to 2015, and features over 100 exploratory probes, landers, and rovers. As you can see on the poster below, the majority of our machines never leave Earth’s orbit. There are a whole lot of crowded lines near our planet, each of which belongs to a space probe or explorer of some kind. But as you get further from Earth, there are less and less of these brave explorers, and you get to see just how far humanity has travelled into our Solar System. "From the Luna 2 in 1959 to the DSCOVR in 2015, this colour-coded chart traces the trajectories of every orbiter, lander, rover, flyby, and impactor to ever slip the surly bonds of Earth’s orbit and successfully complete its mission-a truly astronomical array of over 100 exploratory instruments in all. Featuring hand-illustrated renderings of each spacecraft juxtaposed against the serried giants of our Solar System, this galactic survey is a testament to man’s forays into the grand cosmic ballet." We might have spent most of today figuring out the flight paths of all of our favourite spaceships, but we're still amazed at how many of them have made the trip around Jupiter. If cosmic exploration is your thing, you can pre-order one for you bedroom (or office) wall from Pop Chart Lab. Check out the full size image here.